Our friends at Marlow's Tavern heard that our baseball team may not get to play a home game all season and offered to help us raise money to #fixthefield and #stopthesinkhole! 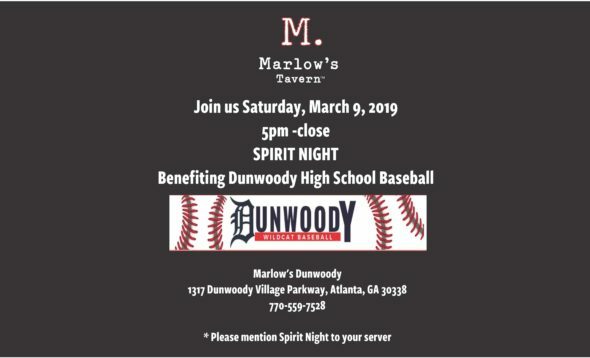 The entire community is invited to dine at the Dunwoody Marlow's Tavern on March 9th from 5 PM to close and Marlow's will donate 15% of their food and alcohol sales back to the Dunwoody Diamond Club! * We'll be raffling off signed Nick Chubb and Sony Michel UGA jerseys too! Plus, they are feeding all of our coaches that day for FREE! Come catch a game at our Dunwoody Senior Baseball borrowed home fields on Saturday the 9th before or after you stop and eat at Marlow's Tavern! *Wildcat Card discount does not apply on March 9th during the fundraiser. As many of you are aware, we have a major drainage issue with the Dunwoody High School baseball field. Basically, we have an inoperative drainage system that has not been maintained properly by the DeKalb County School System. The Diamond Club has band-aided the problem for many years, but we are no longer physically or financially able to stop the deterioration. The unprecedented amount of rain this past year is complicating matters. The rain plus the inoperable drainage system equals the need for several days in a row of sunshine with ZERO rain for the field to be playable. The parents on the Diamond Club Board sent a letter to Dr. Green and his staff on February 21, 2019 describing the problem and suggesting a set of recommended solutions. The staff responded immediately with questions and we have provided further details and photographs. Coach English and Bob Cucchi have since walked the field with facilities representatives from DeKalb County School System. We are currently amid discussions regarding short- and long-term solutions with DCSS and will share further information once we have plans in place. However, at this point we are not sure if/when we will be able to play games on our field. Meanwhile, we have had to reschedule, postpone or cancel 27 games so far this season. Coach English is working diligently every day to make sure we have games to play and a field to play on. As soon as changes are confirmed, we are updating on Team Snap and our website so that parents and players can plan accordingly. Please be patient with us as it takes much time and effort to rearrange all the logistics involved for each game. Please note that Dunwoody Senior Baseball is working closely with us to reschedule some games on their fields. They are being extremely gracious and sent a note to their middle school program today informing them to expect schedule changes as they are trying to do what they can to accommodate our DHS baseball program. Feel free to go on Dunwoody Senior Baseball’s Facebook page and thank them! We will keep you posted as more information becomes available about repairs to our pond/baseball field. DHS baseball field unplayable for season? It's true. We haven't had a home game yet all season. We've rescheduled, moved or cancelled 27 games for our three teams so far this season. A combination of rain, broken drainage pipes and 14” deep sinkholes threaten to make the Dunwoody High baseball field unplayable this season for safety reasons. Shown is one 40-square-foot sinkhole in the outfield near where a storm drainage line is broken. While the area has had an inordinate amount of rain in February, the baseball field problem is more than four years old. Since then the Dunwoody Diamond Club has spent thousands and used parent and student labor to add fill dirt, level the field and dig 15 dry wells. Parents say most of the outfield is saturated with 6 to 8 inches of mud and is unsafe. Now the Diamond Club is seeking a permanent solution with the help of the DeKalb Schools. In the meantime, the 9th grade, junior varsity and varsity have little hope of a home game this season. To add to their woes, the varsity nine played a game Saturday night at the Dunwoody Seniors field next to Peachtree Charter Middle. In the bottom of the 7th inning, the Wildcats were down a run but had the bases loaded. Then the lights went out. The new Dunwoody Senior fields are governed by an agreement with the city that the lights must be shut down at 11 p.m. The game goes into the books as a loss. *****There will be a mandatory Player/Parent meeting on Wednesday (2/6) @ 6:30 in the Library at Dunwoody High School. At least one parent must attend. Dues will be collected. If you are unable to volunteer for your slot, you may arrange for and pay an approved teen worker to work for you. Please contact Carol Gaultney (5gaultneys@gmail.com) or Shelley Levy (levycrew@comcast.net) for a list of approved teen workers. Preapproved teens can only be used for Cashier spots. If you have any questions about concessions, please contact Carol Gaultney (5gaultneys@gmail.com) or Shelley Levy (levycrew@comcast.net). Please read this entire message carefully including all of the linked documents. Arrive at 7 to register and pay dues/register in the hallway just outside the Media Center. Go to your grade level table. Meeting will begin at 7:30 sharp but you must have provided your updated contact information, completed forms and paid dues to attend the meeting. Click here to see a black and white sample of the 2019 Wildcat Card plus the coupons that accompany it! Click here to see all volunteer openings and come ready to sign up! This is a MANDATORY meeting for each player and at least one parent/guardian. - All players will receive a player pack, which is paid for out of player dues. Player packs include five items: 2 short sleeve t-shirts, 1 long sleeve t-shirt, a sweatshirt, and a pair of shorts. You do not to need to order player pack items - they will be ordered for you using the sizing you provided at the kickoff meeting on 1/10/19. Baseball hats will also be provided as part of the player pack. Jerseys will be provided but must be returned. - DHS provides helmets to share. If players want their own helmets, they will need to order them from the online store. - DHS also does not provide pants, belts, cleats, turfs, sliding shorts, gloves, batting gloves, bats, stirrups, etc. Some of these items can be ordered through the online store, some must be purchased elsewhere. - Spirit wear for family and friends can also be ordered through the online store. The online store is open and can be accessed via this link: https://dunwoodybaseball.itemorder.com. The store is scheduled to be open until next Wednesday 1/30/19. PCMS baseball tryouts will take place on the new PCMS west baseball field on Wednesday, January 23 and Thursday, January 24 from 4:30 - 8 pm. Players will need full gear as well as tennis shoes. No Metal Cleats allowed! Only seventh and eighth-grade students are eligible to play. Students that are interested in playing for PCMS should register their interest on the sign-up sheet posted on the PCMS gymnasium door as soon as possible. THE 2019 WILDCAT CARDS ARE HERE! All high school players have their cards and have begun selling. If you don't have a baseball connection please send an email to dhswildcatbaseball@gmail.com and we will assign a player to sell you a card. Following is a sample version of the new card. Coach English just learned that the state is allowing us to start baseball a week earlier this year. So we will have our first day of tryouts on Monday January 14th. The pre-tryout meeting will now be this upcoming Thursday (1/10). The field will be in "ok" shape after a week of sun but Coach English is currently trying to obtain permission to use the Dunwoody Senior fields. We will let you know as soon as we find out. Thursday, January 10th at 7 PM in the DHS Cafeteria. We will check for physicals and go over tryout information. All prospective players and at least one parent are encouraged to attend. The goal is to have teams decided by 1/17, weather permitting. We will practice or continue tryouts on Friday, Saturday and Monday (Martin Luther King Day). Players need to have a current physical uploaded onto Privit or a paper copy on file with Coach English or they will not be allowed to tryout. Tryouts will last from Monday until Thursday. We will make cuts each day. The tryout process will be similar to a regular practice and each player will be evaluated by all coaches. We will make decisions based on ability, ability to be coached, attitude, and effort just to name a few. Currently the team kickoff meeting is scheduled for January 28th. (7 PM in the Media Center) but we will likely move the meeting to an earlier date and will let everyone know as soon as possible.